I hope everyone enjoyed the holidays! I had a quiet but nice Christmas. It wasn’t filled with surprises because I was responsible for buying my own presents, but that arrangement worked out really well because I got exactly what I wanted! And what I wanted was fabric. Lots of fabric. And some beads. Which meant it was time to take a trip to the garment district! I haven’t been into NYC to buy fabric since my birthday (in April) so I was really excited! This year I’m aiming to make detailed, higher quality garments, so I went for quality over quantity…but I still got an absolutely ridiculous amount of fabric. This is going to be a post about what I got and what I hope to do with it! I’ll start with the most elaborate fabric, which I definitely did NOT need. I was pretty good about sticking to my list this time, but when I saw this I couldn’t resist! 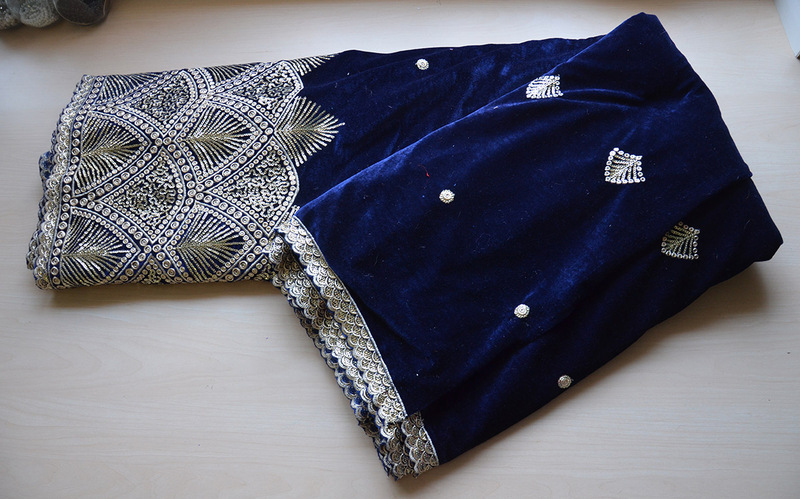 It’s a low pile velvet decorated with gold embroidery and sequins. I wish the velvet quality was a little nicer, it isn’t very pleasing to the touch but it does look lovely. I fell in love with the colors and embroidery pattern and knew I had to have it! I got it for $12 a yard from Amin Fabrics but I saw it at other stores too. 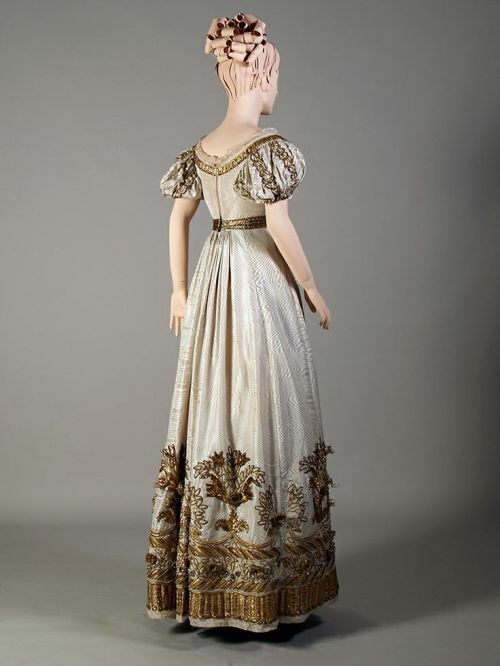 I know this has indian inspirations behind it, but I think it could make a lovely regency court gown. Definitely not an accurate one, but it could be so pretty. I feel like fabrics like this do all the work for you and I don’t want to cut into it too much, so a style like that would suit it well. I actually bought satin! I haven’t bought satin in…years? I think it has been years! 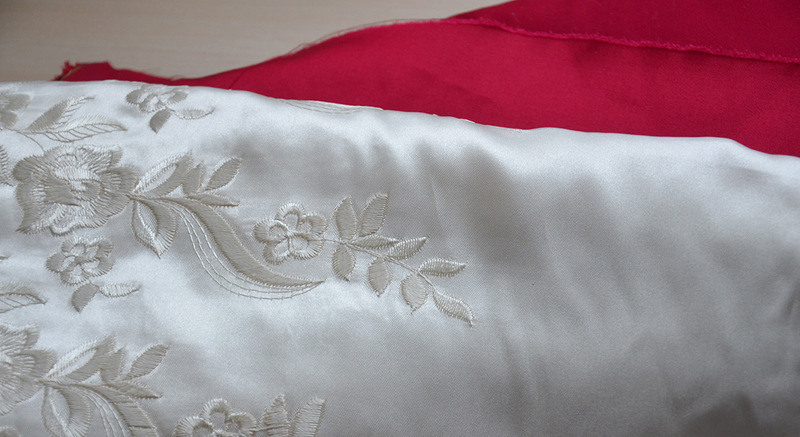 This is an off white polyester satin with matching embroidery all across the fabric. In the store I really really liked it and decided it was perfect for a simple Regency dress, which i’ve already started on. Now that i’ve played around with it I have mixed feelings about it, because I think the sheen makes it look a bit cheap.The sheen is actually identical to some silk satin I have, which is a high quality fabric. 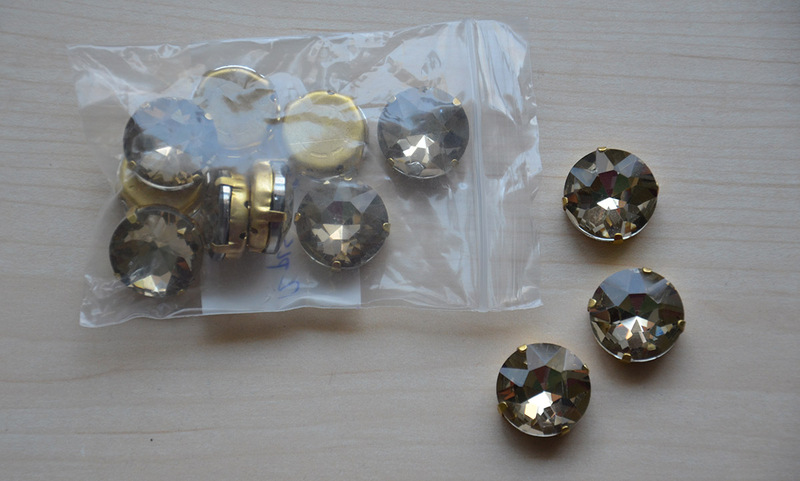 So maybe i’m just not used to shiny fabrics…or maybe it looks like costume satin and i’m in denial. The red fabric underneath it is a cotton sateen. I’ve actually used this exact material a LOT, I’ve made two dresses, a bonnet, and a corset from it and I still adore it. I love the weight, color, sheen, and price! So I picked up another six yards on this trip. 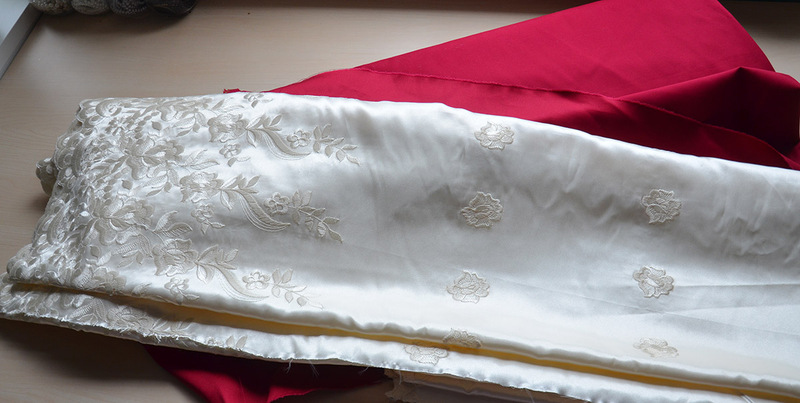 It will be used for a robe a la polonaise, worn over the ivory satin dress. 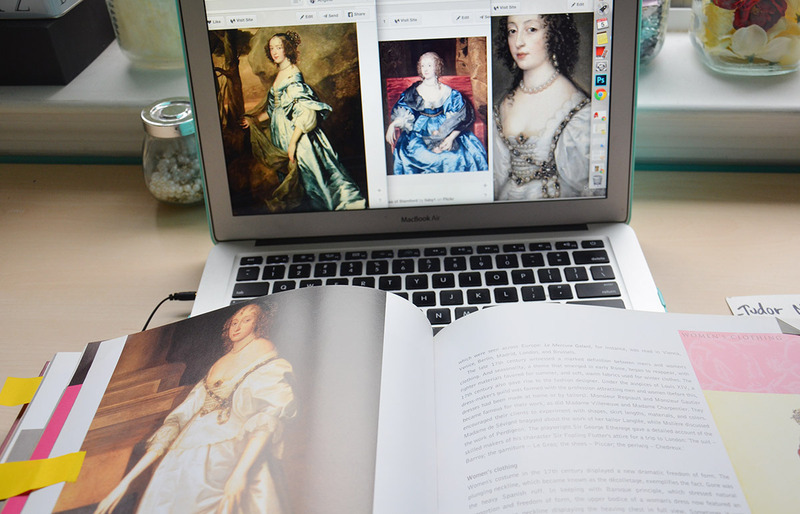 This year i’m finally going to tackle a gown from the 1640s! 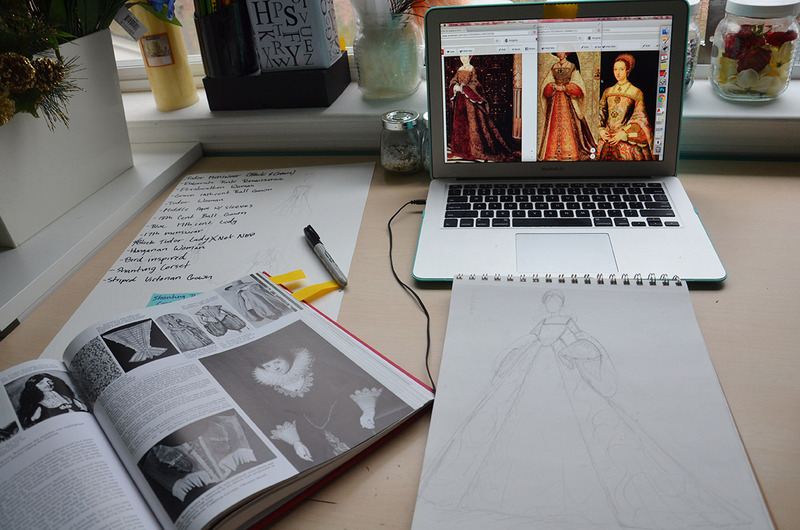 It’s my favorite period when it comes to fashion and i’m so excited to make something for it. It will be of this style. 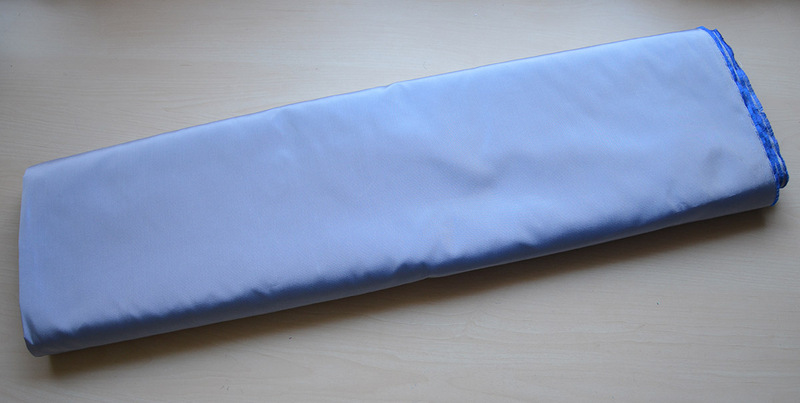 I chose a light blue taffeta for the project, I had hoped to find a richer shade but I think this color is nice too! 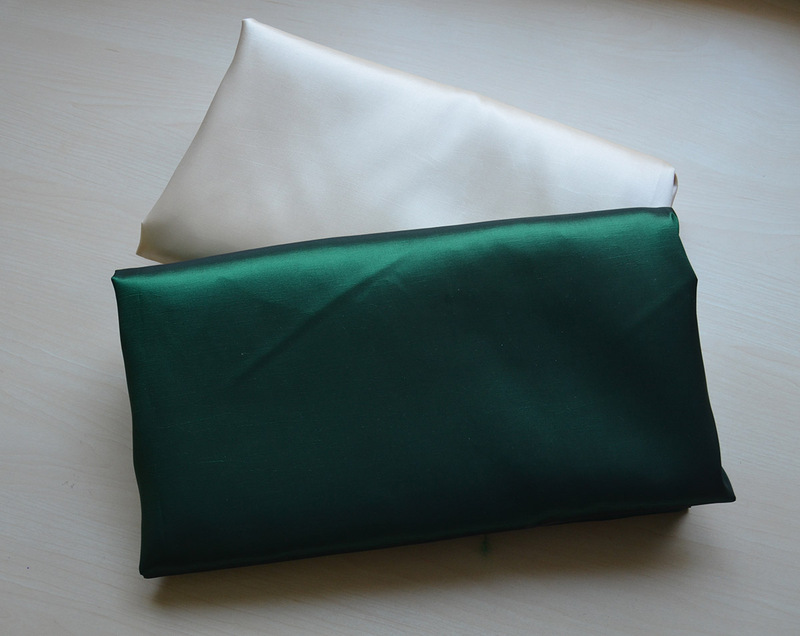 I also got eight yards of champagne colored taffeta and eight yards of this lovely emerald green. Jewel tones are my favorite colors and i’m looking forward to working with these! They will eventually be turned into a monster ball gown from the mid 1800s. 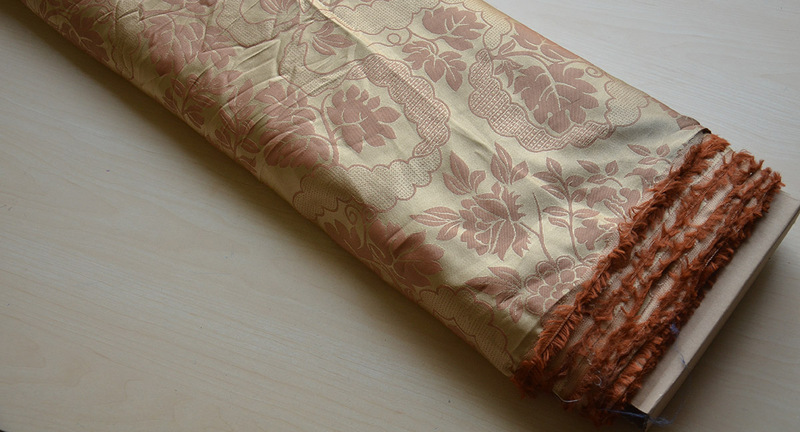 I picked up eight yards of this ivory damask. I wish I could remember the shop name from where I bought this so I could recommend against visiting them. I was browsing trim while they cut this and when I unrolled it at home I found that over a yard is filthy and the weave is damaged beyond repair! Very annoying. 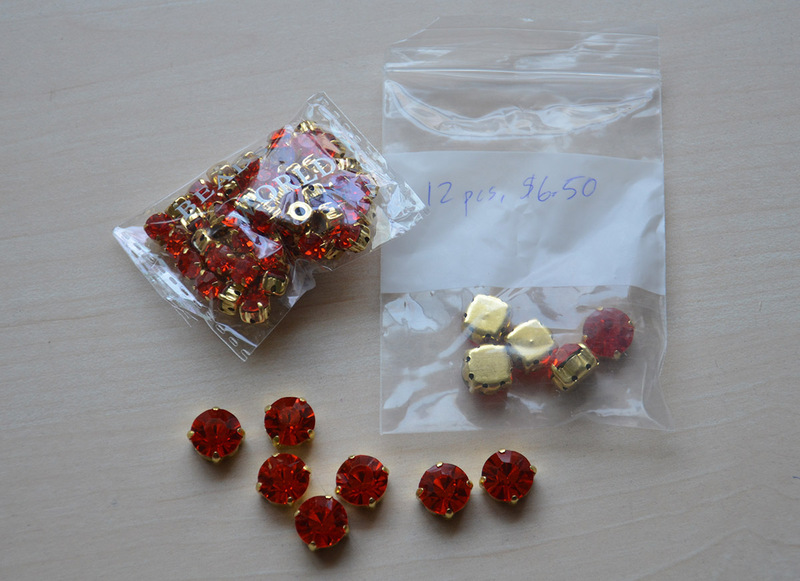 Hopefully I will still have enough to make the dress I planned. It will be an unusually elaborate dress that will be worn under a riding coat, with a mid 1700s theme. I also picked up a lace to pair it with! This is from Dianas fabric. 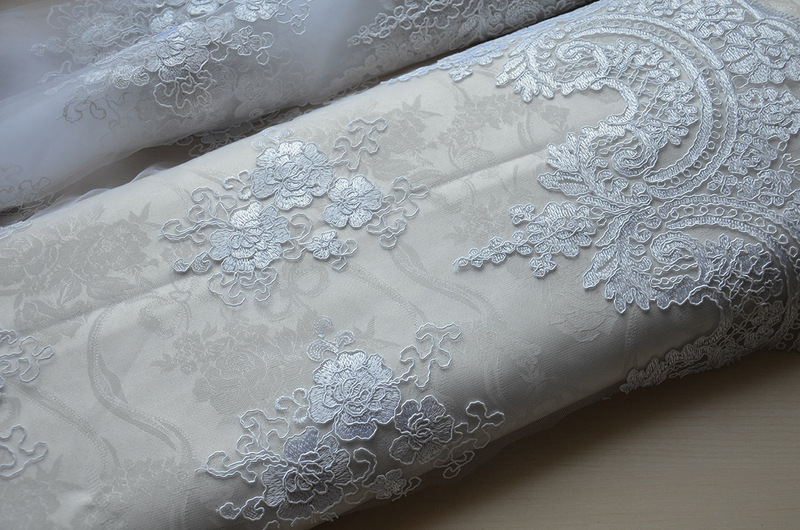 It was $13 a yard, it’s sixty inches wide and both edges have gorgeous scalloped lace. That means I only needed three yards and I have enough to hem the dress with, so it works out to being cheaper than buying trim by the yard. And in addition to the lace edging, it also has appliques I can cut out and use. Unfortunately the lace doesn’t really match the fabric (damn store lighting) so it may get a tea bath before I start the beading process! 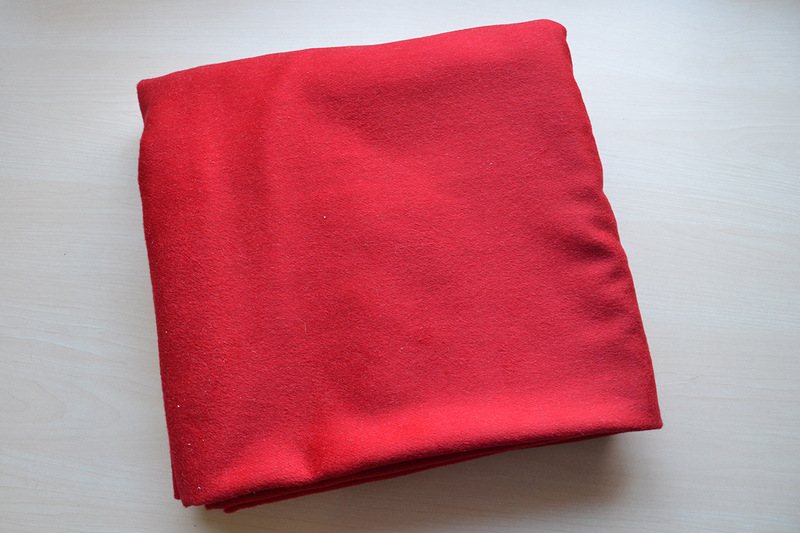 The fabric I bought for the riding coat is a stunning melton wool! Not the most exciting looking fabric of the bunch but I love the weight and texture of this. I got the three yards for $35 which I think is pretty good considering the quality! I’m going to do a heap of research before starting on this project, but i’m so excited. It combines my love of lace and pretty dresses with tailoring, which is great! I found these taffetas in Amin fabrics for $4 a yard and fell in love. They are really light and have a sheen that reminds me a lot of irredecent silk taffeta. I think they will make a really lovely renaissance ensemble. 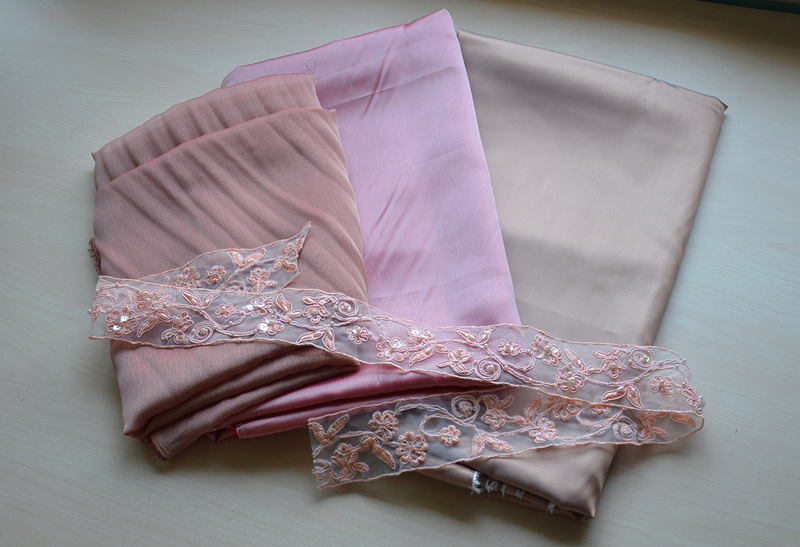 I got some pink chiffon and trim as well, which actually don’t match. That’s what you get for trying to match fabrics without swatches. I think I have some chiffon in my stash that will match anyway, so i’m not too worried! It will always get used for something else! The final fabrics I got are for a Tudor piece. I showed a few of my inspirations here, unfortunately I couldn’t find materials as intensely colored as I wanted. I ended up settling on this gold and orange damask, which I like but don’t love. But i’m confident it will grown on me once I start the project. Bright colors can look a bit garish in historical recreations so I think in the end i’ll be happy with how it looks. 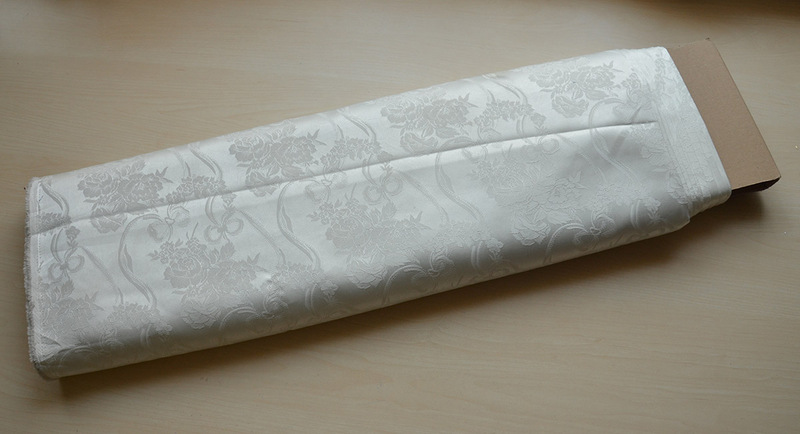 I bought silk – a shock to the people in the fabric stores who remembered me, because I never buy silk. Usually when I ask how much something is they will just respond with “That’s silk” and that means it is more than i’m willing to pay. But this year is about quality over quantity, so I decided I need to have one project that uses something other than cotton and polyester. It’s a nice copper color with some deeper red tones. So that is it on the fabric front. But i’m not done yet! Because my allowance money from the last four months went into beads. My dad and I went to Beads World, it was our first stop and I was determined to buy a lot of seed beads and glass gems. 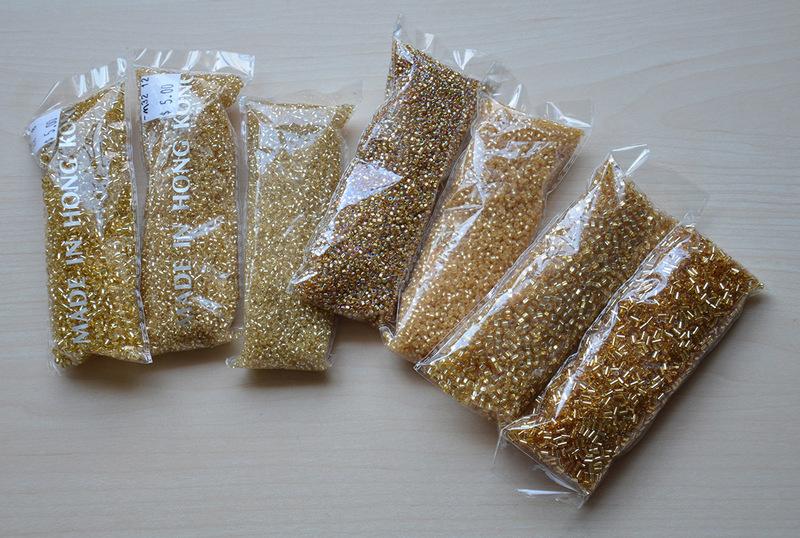 Most of the seed beads I bought were gold, because it’s the color I find myself reaching for most often and crafts stores don’t have a good variety. I also got some orange ones with my tudor gown in mind, some blue ones for the baroque dress, and some cream colored ones of the same size. I would have chosen differently if I had bought the fabric before visiting this shop, but the location of this store meant we needed to go to it first. 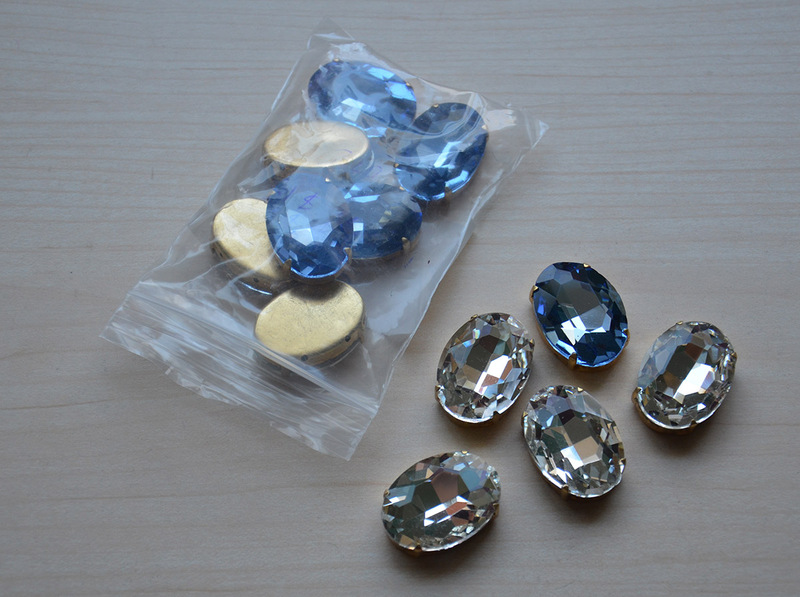 I also really wanted glass gems for my tudor and baroque dresses. 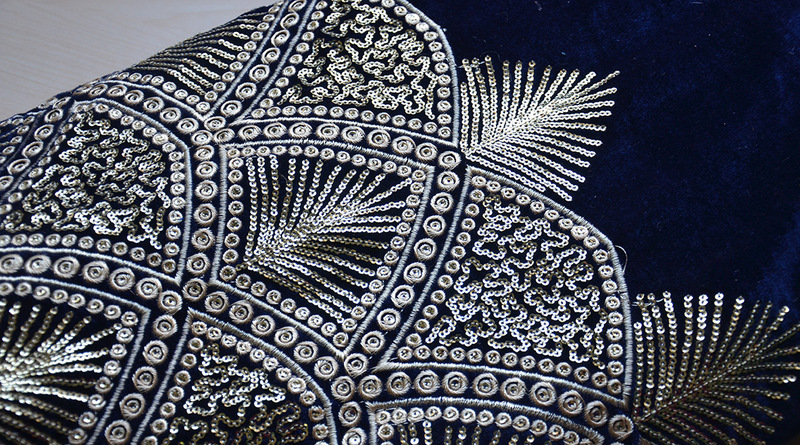 They have very elaborate beading at the necklines which should be easy to replicate with these. I got a dozen of the larger red ones, and a 72 pack of the smaller red ones. I think it was $5 per a dozen and $12 for 72, so I opted for the latter. A dozen of medium sized clear ones and a 72 pack of the smaller ones. I REALLY wish they had some square ones since those are more accurate, but i’m happy with what I got. I think with less variety they will be easier to arrange, so that’s good! Some larger ones in this taupe color. 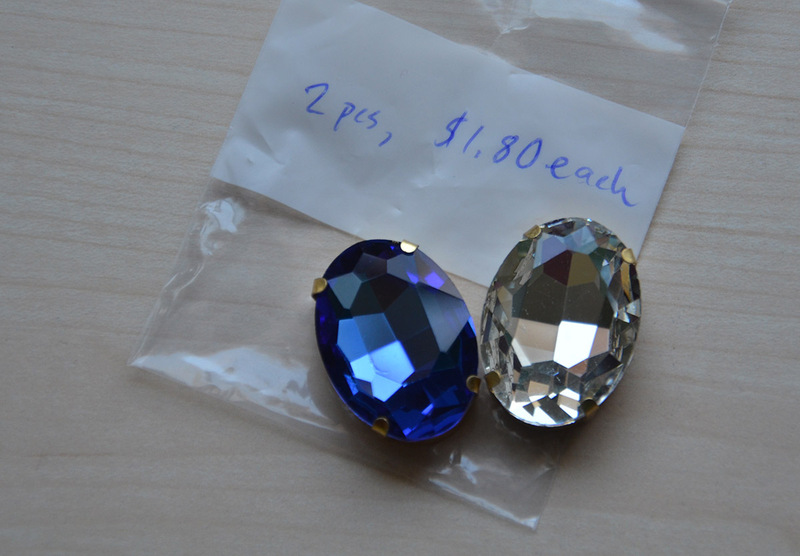 A mixture of blue and clear oval ones! I really adore the color of these blue ones. And two large ones, for pendants. 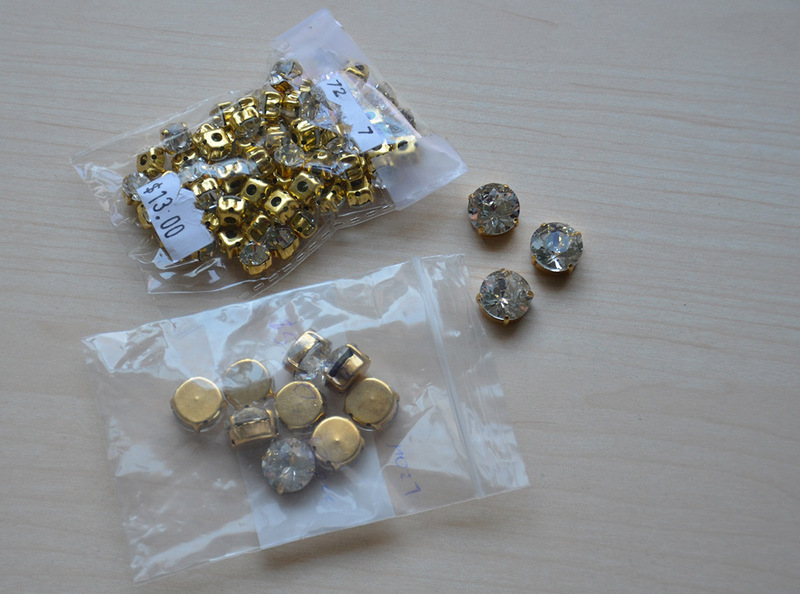 While walking to the fabric stores we came across another bead shop which I got a few things from. I purchased two (massive!) 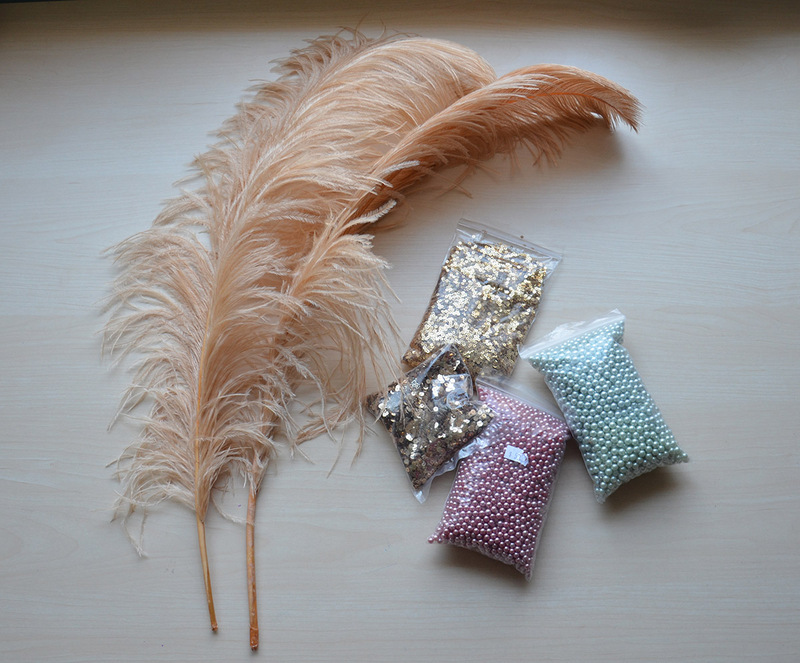 bags of sequins, two bags of plastic pearls, two feathers and some thread. These feathers are fantastic, I never thought I would pay $5 for a single feather but these are just…I can’t describe them, they move like they are alive. Like some sort of underwater creature. It’s fantastic. My dad and I sat on the floor of this shop looking at them and talking about how “Nice those feathers are” which sounds odd looking back on it but was totally justifiable at the time because they are really nice feathers. 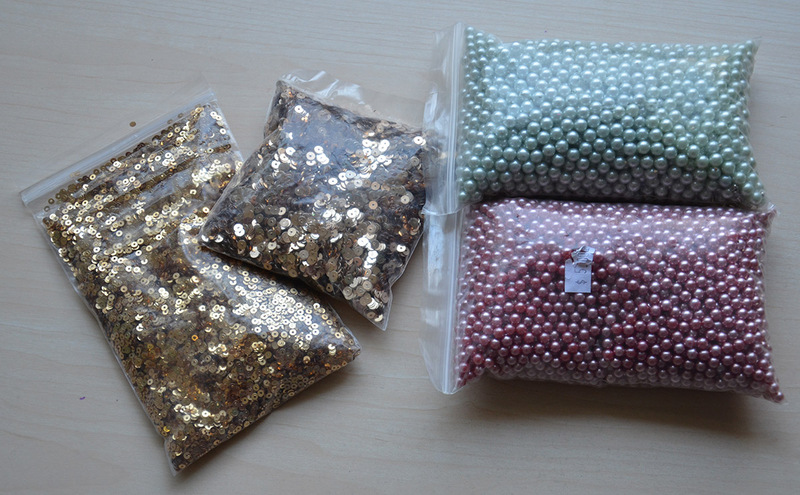 I thought the pearls were super cheap because they were in a big box and all strange colors. I realize now they are probably so cheap because they don’t have holes in them. I am officially the biggest dummy ever. I should have checked but I just assumed beads would have holes in them. Luckily the sequins do, in fact, have holes! I also got three spools of thread because it was really cheap. But a blog post filled with such pretty things shouldn’t be finished with something so boring, so i’ll end this here! I’m not sure if it can really come through my writing but i’m so pleased and excited with what I got and really looking forward to working with all the new supplies! I hope you all had a lovely holiday and I wish you a happy new year! It has been a really exciting year blogging wise and i’m looking forward to continuing it in the new year. I’ll have a big gooey round up post with my goals and such up next week, so I won’t get too mushy here. But thank you all for visiting and reading what I have to say here! It means a lot to me! Thank you for posting these! Your creations are a huge inspiration to me- I started sewing because of you!! I enjoy reading your blog very much 🙂 Looking forward to see what amazingness you’ll create in the new year! Aw, that is fantastic! Thank you! And best of luck with sewing! Thank you very much! I’m glad you like them. Best wishes to you as well! Gorgeous fabrics, looking forward to see what you’ll be making with them. What a fun trip! Those are some serious textile hauling! I could totally relate with the enjoyment of buying raw materials and fabrics! I do tend to get carried away with buying since they are all so beautiful and and and the many things we could do with them too! I do look forward to your future creations! Please do continue making your wonderful European dresses! I know the feeling! That’s why I bring a list, otherwise I get to distracted and end up with a lot more than I had set out to buy. Sometimes it’s hard to hold yourself back when the fabric is so pretty. wow, that’s REALLY a lot of stuff! i was tricked into buying beads without holes too once. i wonder, why do you usually buy 7/8 yds of fabric per dress? do you use all of it or do you like to have a bit of leftovers? how much leftover fabric do you usually have and what do you do with that? thank you and love from Italy! For skirts I ideally need four yards, then I like to have one yard for the bodice and one yard for the sleeves. 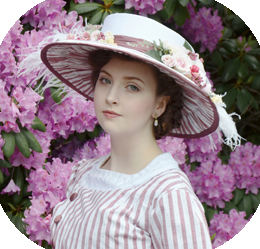 If I want to make accessories, like a bonnet i’ll tack on another yard to make sure I have enough. I’ve made dresses from four or five yards of fabric before, and the end result tends to suffer. This year I want to make some really massive ball gowns, gored skirts, and dresses with long trains which is why I got more! Sometimes I have tons leftover, other times I just have scraps. If I have around a yard left it will get folded and put with other fabrics of that type. If I just have scraps, they go in a bin with all my “leftovers” from various projects! All of your fabrics and notions look incredible and I can’t wait to see what you make! NYC’s garment and bead/trim districts are like Disney World for sewers. For those who have never had the good fortune to visit, it’s almost hard to put into words how overwhelming–and EXCITING–it is. I fall in love with it over and over again. Blocks are lined with little hole-in-the-wall shops, some still looking like they could be sets from classic films. And those long, flat button boxes that are stacked so high on the walls–is there anything more precious?! All the best, and we await your next year of creation. Happy New Year! I would love to have every single one of those fabrics! I’m so looking forward to what you will make with them! 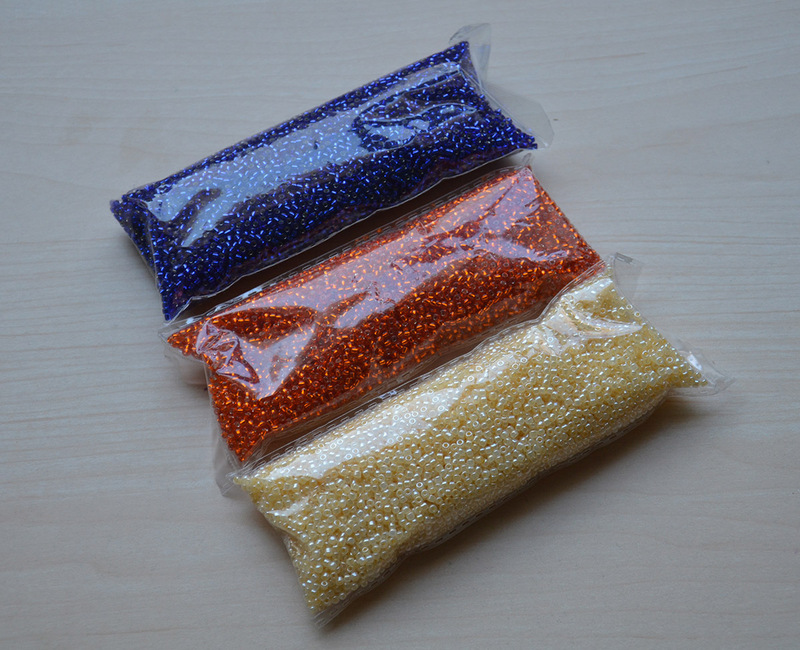 Beads without holes though…. I suppose they’d work for gluing onto things. In fact, for gluing they are probably better than beads with holes. Yeah, I recall gluing beads onto something two or three years ago and being annoyed that the holes were visible. So they definitely have a purpose when it comes to that, but I wasn’t expecting it at all! Oh wow, that is lovely! Thank you for the inspiration! Love your work. It’s truly amazing. The fabric cotton saten it sells in my country it has a little of stretch. In your country it has? Thank you for the kind words! I hope you have a good year as well! 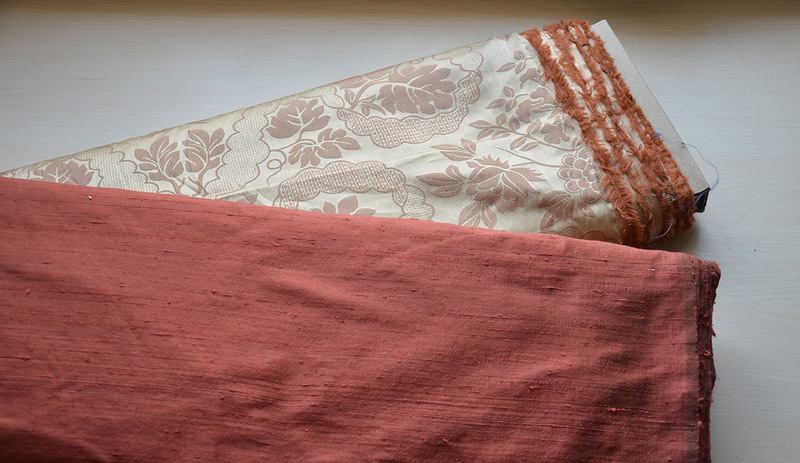 Most cotton sateen here is slightly stretchy in one direction – the type I bought is. But some of the lighter weight ones don’t stretch at all, so it depends on the weave! You found such beautiful fabrics! I have never been to the garment district, but I have wanted to for years! I’m sure it must be easy to find more fabrics than one could afford. The lace that you bought was very beautiful and elegant. It is a shame that it does not match the other fabric. Also, I am sorry to hear about your ruined damask. 😦 That has happened to me before and it is such a disappointment. As for your hole-less beads, you can buy a tool at craft stores like Michael’s and Joann that is for putting holes in beads. This is a link to one on amazon. I hope this helps. I can’t wait to see what you make out of all these gorgeous fabrics and beads! good luck with all of your projects. That blue velvet would make an amazing 1920’s era dress as well! Those are some absolutely beautiful fabrics! I can’t see for beans and mostly just make props and the basic ideas. I strongly believe that you can sell those with no problems. Are you selling? Would you consider?